This article is about the National League player of the 1910s and 1920s. For the American League player of the same period, see George Burns (first baseman). 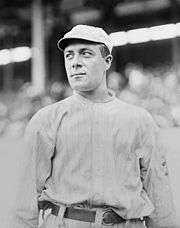 George Joseph Burns (November 24, 1889 – August 15, 1966) was an American left fielder in Major League Baseball who spent most of his career as the leadoff hitter for the New York Giants. A soft-spoken person, he was nicknamed "Silent George" by his teammates, and he was said to be one of the best pool players ever to play major league baseball. He led the National League in runs scored a record five times, later equaled by only Rogers Hornsby and Stan Musial, and also led the league in walks five times and stolen bases twice. 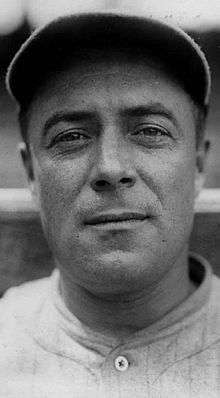 He holds the Giants franchise record for stolen bases in a single season (62, in 1914), and held the club's career record from 1919 to 1972. At the end of his career, his 1262 games in left field ranked eighth in major league history, and his total of 1844 games in the outfield ranked sixth in NL history. In 1927 he became a player-coach with Williamsport in the New York–Penn League, and he returned to the Giants in 1937 as a coach. He later worked for a tannery, and retired in 1957. Wikimedia Commons has media related to George Burns (outfielder).